Lockers are a perfect way to increase security for staff and visitors in a business or public service location. Our workplace lockers help you organise. Whether that means storing substances according to COSHH regulations, giving employees somewhere to keep their workwear or police lockers for securely storing uniforms and radios, quality lockers bring organisation to day-to-day work. In any environment, workplace changing rooms are notoriously disorganised. Our work lockers have been developed to bring structure and management to your space. Choose from divided and welled designs which are perfect for hanging up uniforms and PPE, in a range of different specifications. Clean and dirty lockers give users the opportunity to separate uniforms to be laundered. 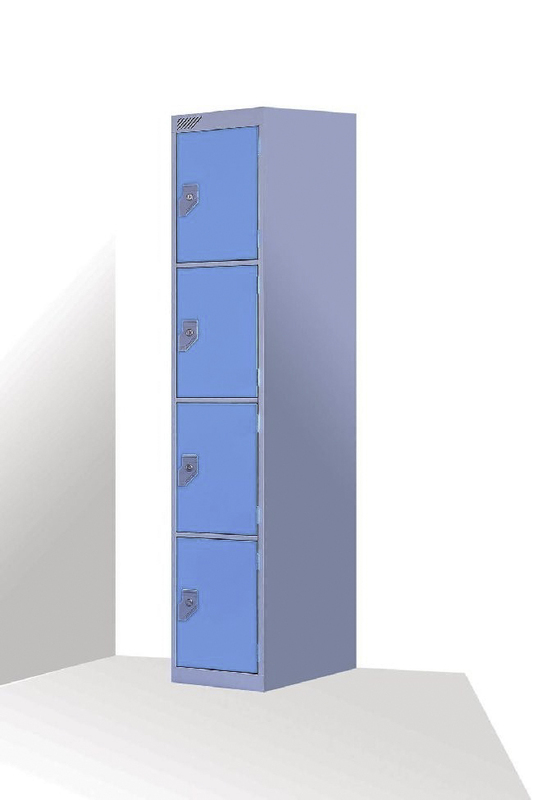 Divided twin lockers give employees full-length space for hanging clothes up, while their narrower width maximises the number of people who can use each space. Alternatively, double door designs with various shelving options are ideal for larger items. 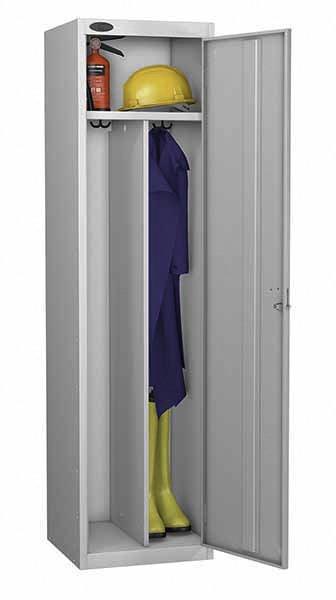 Each robust workwear locker has been made from sturdy steel, and can be safely secured to the wall or neighbouring lockers. Our police lockers have been developed in conjunction with officers, with allocated space for everything from stab vests to riot helmets, and even small charging lockers for radios. Twin lockers are designed for workplaces where space is scarce. Smaller compartment for storing folded garments & shoes. Designed to safely store and charge tools in a safe ventilated environment. Each compartment is fitted with a standard UK three-pin socket. Other options are available for inventory control devices. This locker is available in two sizes. Dimensions: 1775mm high x 300mm wide x 450mm deep, flat top. Door colour is from our standard colour range. or swivel hasp locks to take a padlock. Phone charging and personal effects lockers, this small compartment locker is ideal for charging and storing small electronic products, phones, scanners, small printers etc Lockers are available in 5, 10, 12,20, 30 and 40 compartments, lockers have as standard key locks with 2 keys or swivel hasp locks to take a padlock. Large selection of locks available at a premium. A range of lockers designed to be used as Police equipment storage, this range is ideal for any staff lockers where kit needs to be organised. This range of large lockers is available as standard with key locks 2 keys per lock or swivel hasp locks to take a padlock.